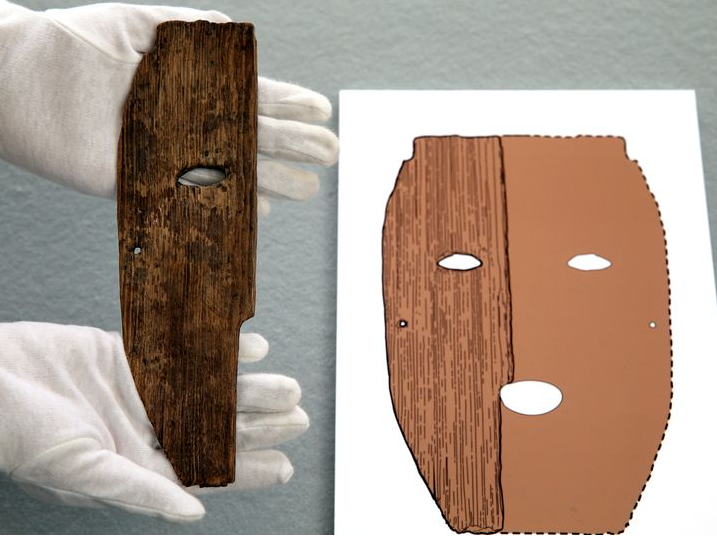 Once used to hide a face, a wooden mask fragment recently discovered here and currently on public display hints at ancient cultural links between this part of western Japan and China, archaeologists said May 30. According to the Sakurai city board of education, the mask unearthed at the Daifuku archaeological site likely dates to the latter half of the second century in light of accompanying finds. This places it several decades earlier than the previously oldest known wooden mask in Japan, which was unearthed at the nearby Makimuku site. The latest find from Daifuku represents only the left side of what would have been a whole mask. It is made of Japanese umbrella pine and is 23 centimeters long, up to 7 cm wide and 5 millimeters thick. There are no artificial patterns or coloring on its surface. The fragment has an oval hole, 0.9 to 2.5 cm across, and a circular hole 2.5 mm in diameter. Experts said the larger hole probably represents an eye, whereas the smaller one was likely used to accommodate a string for wearing the mask on the face. It resembles the mask from the Makimuku site that lies only 3 kilometers to the north. Makimuku is considered a hopeful candidate location for Yamatai, a mysterious early nation governed by shaman queen Himiko. Makimuku developed into a major settlement during a post-Yamatai period. Some experts compare the masks from both sites to the ones worn by fangxiangshi, or magicians mentioned in Zhouli, an ancient Chinese text describing the rites of the Zhou dynasty (12th century B.C.-256 B.C.). Exorcism rites involving fangxiangshi, in which a mask was worn on the face and a pike and a shield held in the hands, are said to be an origin of the demon-chasing rituals that continue to this day in Japan. In a separate development, Takashi Nakazawa, a professor of organic biochemistry at Nara Women's University, and his coworkers said May 30 that they used protein analysis to identify a silk product, unearthed in Makimuku in 1991, as made of silk from cocoons of the Japanese oak silkmoth. The product, shaped like a drawstring purse and 2.4 to 3 cm across in size, has been dated to the latter half of the third century. One section in Weishu, the official chronicle of the Wei dynasty of China (A.D. 220-265), says the Yamatai state presented "red and blue silk" to Wei in A.D. 243. The latest analysis results indicate those silk donations may have been Japanese products. "The areas surrounding the Daifuku and Makimuku sites were possibly an ancient hub of Japan-China interactions, including the transfer of ideas and technologies from China," said Hironobu Ishino, director of the Hyogo Prefectural Museum of Archaeology. The Daifuku mask is on display at the Sakurai city center for buried cultural properties through Sept. 29.